The family of a man who died in police custody in Iran intends to sue judicial authorities for burying him without their permission the Center for Human Rights in Iran (CHRI) has learned. Their attorney, Arash Keykhosravi, told CHRI that Mohammad Raji’s body was transferred by ambulance from Tehran 242 miles south to Aligoudarz, in Lorestan Province, where he was buried in a cemetery at 2 am on March 6 against the family’s wishes. Keykhosravi added that he’s investigating exactly how Raji died. Raji died sometime between February 20 after he was injured and detained at a protest in Tehran, and March 4, when his body was identified by a relative. His death marks the fourth known death of a detainee in Iran in the last two months. Mohammad Raji’s son, Mohammad Ali Raji—who was arrested on the same day as his father on February 20—was prevented from attending his father’s funeral despite posting bail. He is still being held at the Great Tehran Penitentiary (GTP) in Fashafouyeh, 20 miles south of the capital. “I will certainly honor my duty and take action against violations of my clients’ rights and the authorities will have to give answers,” he added. Mohammad Raji was a devotee of a Muslim Sufi order in Iran known as the Gonabadi Dervishes. He was arrested along with dozens of other detainees at a protest in Tehran in February 2018 that grew into violent clashes with security forces. Mohammad Raji was also a veteran of the Iran-Iraq War (1980-88), during which he commanded several battalions of Iran’s Islamic Revolutionary Guard Corps (IRGC) in Kurdistan Province, according to the Mazjooban website. In 2004, he left the IRGC and became a farmer in Mazraehabad, a village near the city of Aligoudarz, Lorestan Province, according to the report. The Fars News Agency, which maintains close ties with the IRGC, reported on March 5 that a source had denied that Mohammad Raji died in state custody. Mohammad Raji’s daughter, Tayebeh Raji—who was detained the same day as her father on February 20 but released late that evening—has disputed the claims made by Fars News’ source. She told CHRI that she saw her father being arrested and that the authorities refused to inform her about his whereabouts until after he was declared dead. 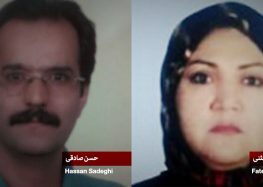 “The authorities should ensure that if there is sufficient evidence of unlawful deaths in detention, the perpetrators responsible will be prosecuted and punished,” added the statement signed by CHRI, Amnesty International, Human Rights Watch and Justice for Iran.